I've just read a recently-published book, The Pope's Legion: The Multinational Fighting Force that Defended the Vatican, by Charles A. Coulombe. 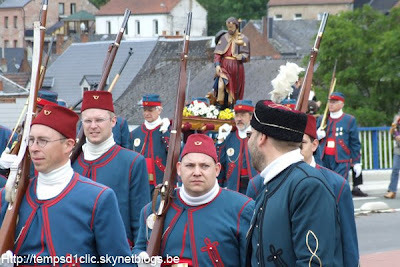 It's the first English study of the Papal Zouaves in over a century and serves as a good introduction to this regiment of volunteers from all over Christendom who banded together to defend Blessed Pius IX and his temporal sovereignty between 1860 and 1871. The New York Herald of 10 June 1868 numbered the zouaves at 4,592, including 50 Englishmen, 10 Scots, 101 Irish, 14 Americans and 135 Canadians. Even Africa and China were represented. The largest nationality was, perhaps surprisingly, the Dutch (1,910), followed by the French (1,301). Coulombe's book tells a thrilling story, although those who know little about the process of Italian Unification might get lost amidst the narrative of battles and campaigns. It would also have been good to have had more quotes from primary sources. However I'm delighted that a book has been published about this neglected story and hopefully future studies will bring us more details about recruitment, organisation, the daily life of the Zouave and the individuals who joined. Alfred Collingridge, who left a Jesuit novitiate in order to join and died in action. George Collingridge, his brother, who later emigrated to Australia and became a well known wood engraver and author. James Coventry from the New Forest who later became a skilled photographer - a book was recently published about him. Joseph Stanislaus Hansom, son of the famous architect and inventor of the 'Hansom cab,' who himself entered his father's profession. The former Zouave designed the churches of the Holy Name, Manchester; Arundel Cathedral; St Aloysius, Oxford (now the Oratory); Our Lady, Teignmouth; the Servite Churches at Bognor and Fulham, and portions of Fort Augustus Abbey and Portsmouth Cathedral. John George Kenyon, who was received into the Church while at Christ Church, Oxford (1870) and joined the Zouaves shortly afterwards. He built the church at Gillingham and was named a Private Chamberlain to Leo XIII. Joseph Powell, author of Two Years in the Pontifical Zouaves. Bartholomew Teeling, who later became the first Secretary of the Catholic Union of Ireland and was named a Private Chamberlain by St Pius X in 1907.He wrote My First Prisoner, a tale of Rome in the first days of its occupation by Victor Emmanuel. 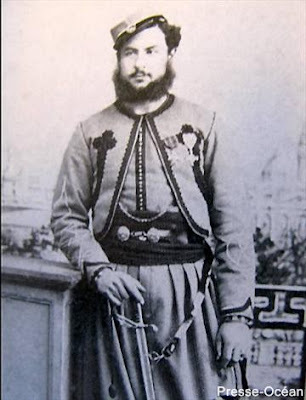 Julian Watts-Russell (‘Giulio’), son of the Vicar of Benefield who converted in 1845 and joined the Zouaves, together with his brother Wilfrid. Julian was killed at the battle of Mentana (1867), one of the most notable papal victories, and was treated almost as a martyr; his monument is still preserved at the Venerable English College, Rome. Interestingly, the year after his death Julian's father, Michael (a widower), was ordained as a Westminster priest. Another brother, Michael junior, became a Passionist and superior of their house at Highgate. Julian Watts-Russell's father was one of the people to whom Newman wrote of his impending reception into the "one true Fold of the Redeemer" while he was waiting for Blessed Dominic Barberi to arrive at Littlemore. He (the father) later became one of the early (if not the earliest of the) English chaplains at Lourdes. Two Years in the Pontifical Zouaves is available via Google Books. Thank you, Father, for the information. This sounds like a "must read". For those who are not familiar with the period, I can't think of a general introduction to the history of nineteenth century Italy and the loss of the Papal States. But other commenters may have some better suggestions. We thought you might like to know. I'll have to add this to my reading list.